Dedicated to making the most authentic pilsner brewed in Canada. Over the past two decades, Steam Whistle has grown from a dream hatched by the “Three Fired Guys” into one of Canada’s largest and most beloved independent breweries. Find out how Canada’s premium Pilsner came to be. 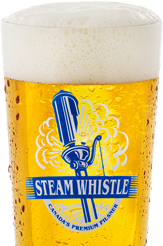 Steam Whistle has a singular vision: to produce a pilsner beer-lovers across the country can be proud of. It’s inspired by centuries of European tradition, but brewed fresh at our independent Canadian brewery. Find out more about the process, ingredients and people that make Steam Whistle Canada’s premium pilsner. Book a tour or pull up a stool and enjoy a pint at the bar! Each year the historic John Street Roundhouse welcomes thousands of visitors through our doors. Come see this architectural gem for yourself, and and grab a fresh pint of Steam Whistle while you’re here! Hailing from Memphis, Julien Baker is an astoundingly powerful voice in modern music, and it’s that voice that immediately draws one into her sparse, devastating and emotionally cathartic ballads. At only 23, Baker will be Sled Island’s youngest guest curator to date.